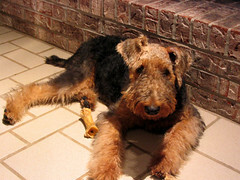 Here is a photo of my parent’s dog Jack, a rambunctious Airedale. I was thinking of him earlier this week when I heard an interview with Marley & Me author John Grogan and then read this article about the book on Slate.com. I don’t think Jack is a misbehaved as Marley, despite what my parents claim. The interview with Grogan was broadcast on one of my favorite radio shows: Michael Feldman’s Whad’Ya Know? To hear the interview find the show archives for April 8, 2006. It is currently the most recent show but that may change by the time you read this. On an unrelated note you may notice a link on the right for count and noncount nouns; this is a page I set up for my morning class. We go to the computer lab every Wednesday and I’m trying to make it easy for my students to get to the pages I want them to visit. The past two weeks or so we have been studying food which leads in to count and noncount nouns.